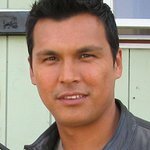 Adam Beach says he looks for acting roles that show how Native Americans see themselves, and show who they are in today’s society, not roles perpetuating romaticised Indian steryotypes. Beach has been an active supporter of Idle No More, a First Nations movement that began in Canada in 2012 demanding that treaty rights and the environment be respected by the government. Google trends for "Adam Beach"
We don't have any videos related to Adam Beach.